I hope that I have proved beyond all possible doubt that the system of is fraudulent; that the people produce the real wealth through their farms, workshops, factories, offices, transport, etc., i.e., the goods and services in the shops and warehouses, yet we have a parasitic group of banks and financial houses that create money based on all this real wealth and load the communities with huge cheating debts created out of empty air. Does it require much imagination to see that this usury cripples the economy of the World as a whole? Technically advanced nations are continually held up from carrying out worthwhile projects though there is plenty of man-power, materials and equipment to do so. Can anyone argue that, if a thing is physically possible then it automatically should be financially possible? However, the environment is being destroyed, especially in the Third World. Does anybody doubt that being able to create money out of nothing, as well as knowing everyone’s financial state gives the big banks tremendous power? I hope the evidence I have given in this paper added to natural deduction should make every reader certain about it. There is evidence that the banks are heading towards a World totalitarian state which is probably why they helped the political totalitarians, Lenin and Hitler, to succeed. The Bankers have had some hundreds of years to learn how to hold on to power. They do it by their ability to keep in the background -to be the “power behind the throne” in fact, though it has to be demonstrated to people in high places at times. They back opposing political factions and they get their agents into businesses, political parties, religious bodies, organisations like the Bilderberg Club, CFR, PNAC, Masons, trade unions, in fact in any sizeable body. Holland. Tony Blair, Gordon Brown, and others in the Labour Party have attended them. There is also the “Trilateral” association between Bankers and governments, and one or two others. In short, in the Western states there is not real democracy, but plutocracies disguised as democracies and all going towards a World totalitarian system. There is a policy to combat this evil. It is called Social Credit; this contends that every country should have full control over its own money system with the creation of credit solely exercised by public bodies responsible to the elected governments of each country. In 1910 US government debt stood at about $1 billion or about $12 per citizen. Now, its about $15 trillion (all levels of government) or about $50,000 per citizen owed to the private owners of the Federal Reserve Bank. Government and corporate debt is inherited. Therefore, whenever we pay taxes or buy corporate products, we pay homage to the owners of the private central banks because part of the money goes to pay interest to them. The total amount owed by consumers, businesses, governments and financial institutions totaled $34.4 trillion at the end of 2003, according to the Federal Reserve. The economy produced $11.3 trillion of output. That makes the nation's debt triple its gross domestic product. In 1933, debt was about 2 1/2 times GDP, according to a study by the Gabelli Mathers mutual fund. When this pyramid collapses, we would suddenly be in a very different World. In 1929, the stock market crashed, but the gold standard held. The monetary system held. Now, we are dealing with something that's more fundamental. The only precedent I know of is the Roman Empire collapse, which ended Roman currency. That was, of course, at a time when it took about a century and a half for the breakdown to spread through the empire; now it would take a few hours. “Washington...has become an alien city-state that rules America, and much of the rest of the World, in the way that Rome ruled the Roman Empire. REMEMBER, REAL OR FIAT MONEY DOES NOT CREATE GOODS & SERVICES. WORK CREATES GOODS & SERVICES!!! Usury is forbidden to Christianity. The Islamic equivalent is "Riba." Riba is forbidden to both the giver and taker. Judaism forbids usury among Jews but preaches usury against the non-Jews. Mayer Amschel Rothschild was prepared by his father to become a Rabbi. Ferociously, he deployed the teachings of unearned profit instead to multiply an embezzled fortune into the House of Rothschild - precursor to the modern, World-wide network of central banks. The money changers of Christ's famous episode at the over-run Temple, practiced this ethic of unearned profit, and unfair trade. Fittingly, usury has been called, an abomination that makes desolation. Hence the great historic, social, and religious significance of usury. The Jews forbade the practice of usury within their own community, while they permitted it to be practiced against outsiders. This is one of the many instances of the Pharisees having altered the revelations in open rebellion against God. Under today’s usury system, new debt always exceeds the new money no matter how much or how little is borrowed, the total debt increasingly outstrips the amount of money available to pay the debt. The people can never, ever get out of debt! An example will show the viciousness of this usury-debt system with its "built in" shortage of money. If $60,000 IS BORROWED at 14% for 30 years, $255,931.20 MUST BE PAID BACK. However, and this is the fatal flaw in a usury system, the only new money created and put into circulation is the amount of the loan, $60,000. The money to pay the interest is NOT created, and therefore was NOT added to "money in circulation." There is therefore no way all debtors can pay off the money lenders. As they pay the principal and interest, the money in circulation disappears. All they can do is struggle against each other, borrowing more and more from the money lenders each generation. The money lenders (Illuminati Bankers), who produce nothing of value, slowly, then more rapidly, gain a death grip on the land, building, and present and future earnings of the whole working population. "People who will not turn a shovel of dirt on the project, nor contribute a pound of material, will collect more money, from the United States, than will the people, who supply all the material and do all the work. This is the terrible thing about interest (usury) ... But here is the point: If the nation can issue a dollar bond, it can also issue a dollar bill. The element that makes the bond good, makes the bill good, also. The difference, between the bond and the bill, is that the bond lets the money-broker collect twice the amount of the bond, and an additional 20%. Whereas the currency, the honest sort provided by the Constitution, pays nobody but those who contribute in some useful way. "It is absurd, to say that our country can issue bonds, and cannot issue currency. Both are promises to pay, but one fattens the usurer and the other helps the people. If the currency issued by the people were no good, then the bonds would be no good, either. It is a terrible situation, when the Government, to insure the national wealth, must go in debt and submit to ruinous interest charges, at the hands of men, who control the fictitious value of gold. Interest is the invention of Satan." "If our nation can issue a dollar bond, it can issue a dollar bill. The element that makes the bond good makes the bill good... It is absurd to say that our country can issue $30,000,000 in bonds and not $30,000,000 in currency. Both are promises to pay; but one fattens the usurer, and the other helps the people." We shall see how subversion of Article I has brought on us misfortune of Proverb 22:7, i.e. the borrowers have become the servants to the lenders. Note that throughout history, people with hidden agendas have always tried to confuse usury with trading and slavery with business. "Under the Constitution, the Congress has responsibility of issuing the nation’s money and regulating its value Art. 1, Sec 8, Cl. 5 enable the Congress to resume its Constitutional responsibilities to regulate our nation's money by liberating our economy from the swindle of the debt-money manipulators by the issuance of national currency in debt fee form ... We have a certain amount of non-interest bearing money in circulation, all of our fractional currency, pennies, nickels, dimes, quarters, and half dollars. They are manufactured in our mints, and are paid into circulation, circulate freely, and provide the government with a valuable source of revenue. From 1966 through 1970 the amount of seignorage paid into the treasury by the mints amounted to in excess of 4 billion dollars; the profit ratio on this type of currency is 6 to 1, or currency 6 times the cost of production. 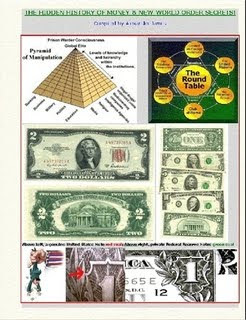 The cost ratio for the private Federal Reserve Notes is 600 to 1; however, during these same four years, 1986 through 1970, 50 billion dollars in Federal Reserve Notes were manufactured by the bureau of printing and engraving and turned over to the banks; not one cent in seignorage was paid over to the Treasury. Our Debt money system compels the government to spend more than it takes in, because this is the only way we can keep the economy going..."
Why is USURY FORBIDDEN? (Latin usus meaning "used" and the word usuria which means demanding in return for a loan a greater amount than was borrowed) There have been many leading figures in history who have condemned usury and the power that goes with it. Besides those quoted, there were Benjamin Franklyn, Lord Acton, Ruskin, Dr Temple, (former Archbishop of Canterbury), Augustus John, (the painter), Dr M.A. Phillips,(creator of M&B 693), Professor Soddy, (the atomic physicist), and others. It often helps us to understand something if we examine origins. Throughout recorded history the practice of usury, along with the practice of giving false measure, has been condemned. Aristotle and Plato in ancient Greece denounced it as well as prophets in the Old Testament and early Christians. Yeshua-Joshua, it should be remembered, drove usurers out of the Temple in Jerusalem and this played a part in bringing about his apparent crucifixion by the Roman Pharisee King Pailatoos (Pilates). Buddhists have condemned it and the Quran does so as well (and probably other religious and non-religious books). While the old usurers at least lent their own money, the modern ones, the Bankers, are able to create it out of nothing. St. Thomas Aquinas, the leading theologian of the Catholic Church, argued charging of interest is wrong because it applies to "double charging", charging for both the thing and the use of the thing. Aquinas said that a lender charges for the loan by requiring the loan to be paid back, in other words, the payback for the loan is the charge for the loan. Any further charge is a charge for using the loan. Aquinas said this would morally wrong in the same way as if one sold a bottle of wine, charged for the bottle of wine, and then charged for the person using the wine to actually drink it (which is the de-facto transaction when you take the loan and buy something with it). Usury (in the original sense of any interest) is scriptually and doctrinally forbidden in many religions. Judaism forbids a Jew to lend at interest to another Jew. It's forbidden in Islam. The most recent Catholic teaching on usury is by Pope Benedict XIV in his Vix Pervenit: - from 1745 which strictly forbids the practice, though given the modern day Catholic Church's own bank and investments in the banking industry, the prohibition has to be regarded as a dead letter. While Jewish law forbids the charging of interest to another Jew, Jews are not forbidden to charge interest on transactions to non-Jews. Throughout history, the interest attached to loans by Jews to non-Jews is widely considered to have been a central issue in causing a perception of usury, and contributing to a climate of anti-Semitism. Allegations of usury have been one factor leading to forceful confiscations of property and discrimination against Jews in business practice. Ethnic-based distinctions surrounding the application of interest charges are often perceived as pronounced, discriminatory and unjust, and can inflame existing ethnic divisions. Usury and giving false measure has been denounced by almost every major spiritual leader and philosopher of the past three thousand years. Plato, Aristotle, Cato (De Re Rustica), Cicero, Seneca, Plutarch, Aquinas, Yeshua-Joshua, Moses and Muhammad are just a few. Deut. 28:44-45: "The stranger that is within thee shall get up above thee very high, and thou shalt come down very low. He shall lend to thee, and thou shalt not lend to him; he shall be the head, and thou shalt be the tail."